Would you like to be the next Dan Brown or J.K. Rowling? Perhaps your aspirations are less lofty, but you still have a story--or expert information--to share with the masses. Unless you are already a bestselling author, landing a publishing deal is easier said than done. Thankfully, though, tools are available for you to publish your own electronic book. I'm no stranger to publishing, having written or cowritten a dozen books. A great deal of pride and satisfaction comes with seeing your written work sitting on the shelf at Barnes & Noble--a dying concept in and of itself. Would you settle for seeing your book on the digital shelf at Amazon.com? For a small or medium-size business, self-publishing has a variety of potential benefits. Being published--even self-published--enhances your reputation and credibility. It establishes your business as an authority, and can lead to new opportunities, sales leads, or invitations for speaking engagements and other prospects for gaining exposure. You have assorted options, including Amazon's CreateSpace and Kindle Direct Publishing; Barnes & Noble's PubIt; Lulu; and SelfPublishing.com. Whether you want to create an actual paperback book to ship to readers (or a music CD or movie DVD, for that matter), or you just want to crank out an ebook for digital download, such tools make the project relatively simple. If writing an entire book seems daunting, you might prefer to take an existing blog of yours and publish it via Amazon so that everyone with a Kindle can download and read your posted material. Kindle Blogs are wirelessly delivered and updated automatically throughout the day; the content downloads to a reader's Kindle and remains stored for local access even when no wireless network is available. 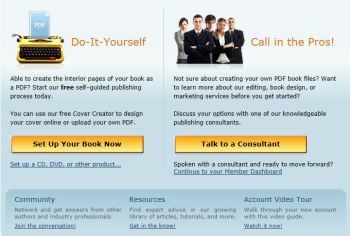 You can publish a book entirely by yourself, but most services also offer professional help for a fee if you want it. For starters, you need content: Self-published books don't type themselves. Most ebook publishing services are at least capable of working with Microsoft Word files, PDFs, and the open-source ePub format. The Amazon Kindle Direct Publishing service--which I'll focus on for this article--can work with .doc, .docx, .rtf, .pdf, .epub, .txt, .zip, .mobi, or .prc files. Amazon recommends creating and editing your content in Microsoft Word. When the book is done, remember that with self-publishing comes self-promotion. You won't have a publisher with a marketing budget and a vested interest in the success of your book out there pitching it for you. Use all of the tools at your disposal to let your customers or the broader intended audience know the book is available. Mention it in your email signature and on your website. Post a status update and link to it on your Facebook page. Tweet about it. Make sure to promote the book every which way you can. Although CreateSpace, Kindle Direct Publishing, Barnes & Noble PubIt, Lulu, and SelfPublishing.com provide the tools to do it yourself, many also offer professional services for a fee. For example, CreateSpace provides a comprehensive list of professional services, including copyediting, content formatting, illustration, cover art design, and even marketing services once the book is published. The CreateSpace Unique Book Cover service is $499, though, so be prepared to spend some money. You want your book to have a polished, professional look, but you don't want to invest a fortune self-publishing either. You have to find a balance, creating a book that looks good enough to buy, but not spending so much that you lose money in the process. Unless you pay (or barter with) a professional, it's up to you to check the quality of your work. This is a book that you expect people to spend money on, and enjoy or gain some benefit from; the least you can do is to put your writing through a spelling checker, and to ensure that you haven't made any glaring grammatical errors or introduced any formatting issues in the document you submit. 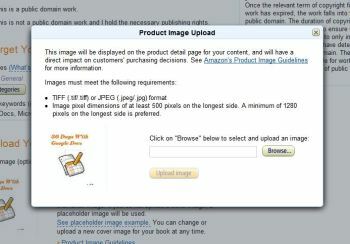 Follow some simple guidelines to upload cover art and add black-and-white images to your book. You can use some text formatting--such as bold, italics, or underlining--for emphasis, but don't go crazy. Decorations such as bullet points, fancy fonts, or information in the header or footer area of your document won't translate to the finished product. Tables can be tricky, too. To ensure that each chapter will start on a new page and not just run together like one big chapter, insert hard page breaks at the end of each chapter. In general, any images you include should be centered on the page. Keep in mind that if you are creating a digital ebook, the Kindle and most other e-readers will render the page in black and white or shades of gray, so some things may not look as nice as you intend. You are not obligated to include all or any of these things, but your book will have a more professional look if you at least include a title page. It can be as simple as placing the title of the book in the center of the very first page with the author's name beneath it. Large-format e-reader now comes with improved contrast and Wi-Fi.